Our skilled sausage makers developed our own unique recipe for the Chicken Sausage with Apple and the Vermont Maple Chicken Sausage. These cob-smoked varieties are extra crispy and tasty cooked on a grill. They are also perfect for any meal served with pasta, on a bun, as an appetizer or even for breakfast. Use your imagination and experiment with these lean morsels of chicken sausage delight. Thanks to the partnership forged between Dakin Farm and our friends at North Country Smoke House, across the river in New Hampshire, we are able to expand our offerings to you with the Cilantro and Chipotle Chicken Sausage, Garlic and Rosemary Chicken Sausage, and the Tomato and Basil Chicken Sausage (see our fun flavors in the drop down menu below). Part of what makes these gourmet sausages so special is that every ingredient is top quality, authentic, and chosen with care. Filled with coarsely ground, lean meats in unobtrusive, natural casings, each robust link is bursting with its own well-rounded palate of distinctive, natural seasonings. 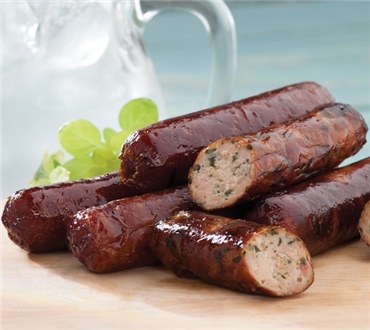 All sausages arrive fully cooked, making them easy to gently warm and serve! One of my Dakin Favorites! I love this chicken sausage so much that I order it all the time to be shipped to us in Maryland! There isn't a lot of fat in these sausages and the chipotle & cilanto give them a good flavor. This sausage is absoutely amazing!!! This sausage is above and beyond all others!